Situated on the EVER POPULAR CHURCH VIEW on St Peters Gardens estate is this three bedroom semi detached house. The home is situated within close proximity of LOCAL SCHOOLS and the nearby HADRIAN ROAD MTERO STATION . Benefiting from being sold with NO ONWARD CHAIN the property briefly comprises; hallway, cloaks/WC, lounge, dining room, kitchen and CONSERVATORY to the ground floor. 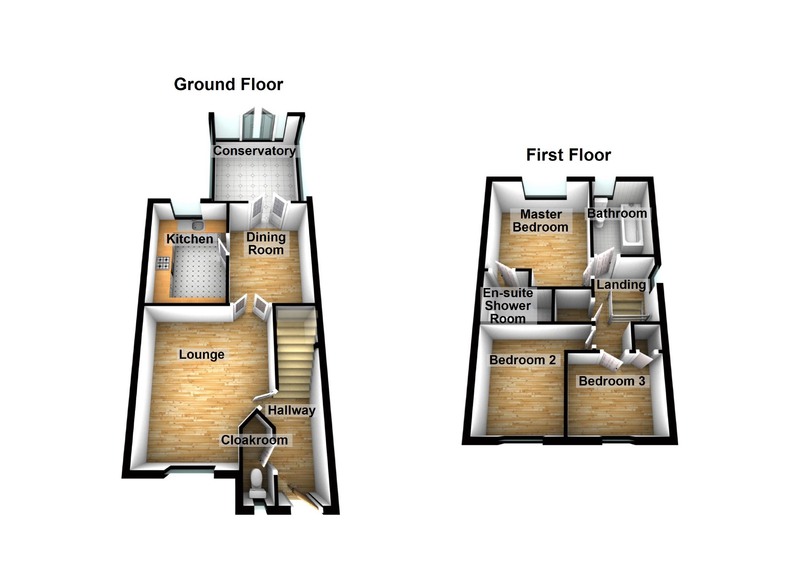 To the first floor there is a master bedroom together with an EN-SUITE, two further bedrooms and a family bathroom. Externally there is a garden to the front together with SPACE FOR ON SITE PARKING and a garden to the rear. FREEHOLD. Council tax band B. Energy rating TBC. To arrange a viewing call next2buy on 0191 2953322. Hallway - Glazed door leading into entrance hallway, radiator, stairs to the first floor landing. Wc - Double glazed window, radiator, WC and wash hand basin. Lounge - 4.47m x 3.86m (14'8" x 12'8") - Double glazed window, radiators, fire surround with an electric fire, decorative coving, glazed doors leading to the dining room. Dining Room - 3.30m x 2.41m (10'10" x 7'11") - Double glazed French style doors leading into the conservatory, radiator, under stairs storage cupboard. Kitchen - 3.51m x 2.26m (11'6" x 7'5") - Double glazed window, part tiled walls, fitted with a range of floor and wall units, counters and sink, electric hob and oven and extractor hood over, integral washing machine and fridge/freezer. Conservatory - 3.18m x 3.71m (10'5" x 12'2") - Double glazed French style doors leading to the rear garden, radiator, tiled flooring. Bedroom 1 - 3.43m x 3.15m (11'3" x 10'4") - Double glazed window, radiator, laminate flooring, fitted with a range of bedroom furniture including wardrobes and dressing table. En-Suite - Radiator, part tiled walls, laminate flooring, fitted with a three piece suite including a separate shower cubicle. Bedroom 2 - 3.35m x 2.41m (11'0" x 7'11") - Double glazed window, radiator. Bedroom 3 - 2.39m x 2.31m (7'10" x 7'7") - Double glazed window, radiator. Bathroom - 2.21m x 1.60m (7'3" x 5'3") - Double glazed window, radiator, part tiled walls, fitted with a white suite and a shower over the bath. External - There are attractive gardens front and rear. Together with space for on site parking to the front.